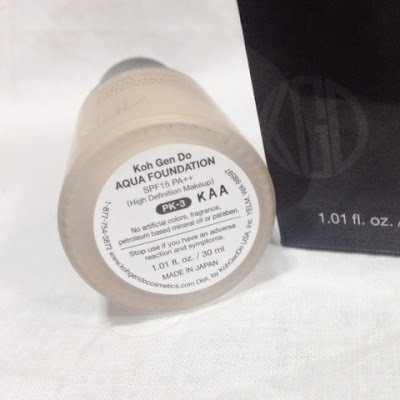 Koh Gen Do Aqua Foundation | Vanity and Everything in Between. If I were to check how many liquid foundations I have on my vanity, it's probably more than 10. Definitely more than 10. Obviously, I don't need another one. But while I was looking around Beauty Bar one day, I saw Koh Gen Do's Aqua Foundation on sale with 45% discount. Major steal! The discounted price might have been a give away not to say no to this foundation. What made me buy this product though is the fact that it's water based. I just love water based foundations. There were still a lot of shades available when I got this back in March. I was choosing between OC-2, OC-3, and PK-3. I even swatched them directly on my jawline just to see how close the shades are with my skin tone. It wasn't much help though cos I couldn't distinguish. The bright white lights didn't help either. So, I went ahead and asked the SA. She advised that PK-3 suits me better cos it gives me more colour. I asked her what she meant but she couldn't explain further. So, I was like, okay will settle with PK-3 then. This is how PK-3 looks like. From the back of my palm, it seems like a perfect match, yeh? When blended though, it seems a tad darker. But I thought that would be fine cos once it oxidises, it will turn light on me. Yes, lighter not darker. 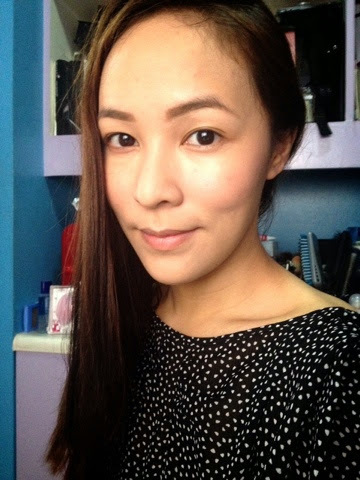 When applied on my face though, it is a bit lighter than my skin tone. But not light enough that I would get stares for having a white cast. Nothing like that. The photo below shows my face with one layer of the foundation. It looks extra light because Mr. Sun is hitting all the right places on my face. Since it's water based, it can only give light to media coverage with the exception of fully concealing very red spots and other major blemishes. I wasn't sure if this could really conceal dark circles as I didn't apply it on my dark circles. I only applied one layer because the first time I used it, I applied two or three layers but nothing significant happened. It's both good and bad. It's good because it didn't cake at all! It's bad because no matter how I pack on the blemish on my cheek, it's still showing up. Boo. This foundation feels so light on my face no matter how many times I layer it. Y'all know how it is here in Manila right now cos it's summer but I still use this liquid foundation! It starts to fade on the 6th hour of wear but when you remove this using a makeup tissue remover, you'd still see a lot of foundation on the tissue remover which proves that this stays on your skin. In terms of keeping oil at bay, I've tried my Ben Nye powders to set this foundation and my T-zone didn't oil until in the afternoon. I haven't tried leaving the house without setting this foundation so I wouldn't know how long it can keep the oil at bay without a setting powder. 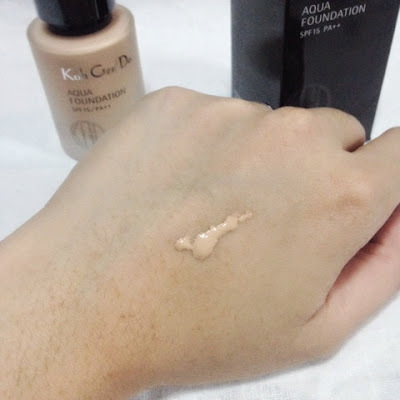 I love this foundation because of its properties although I have a love-hate relationship with the shade I got. Sometimes, the shade fits me perfectly, sometimes it's too white on me. The shade range confuses me, too. For me, the shades don't have a huge difference and most of the shades are still light. Or is it because this is a Japanese brand and cater to women with lither skin? Je ne cun idea. So when I finish this, I'll try the OC shade. I got this foundation for PhP1,500++ as it was on sale. Original price is almost PhP3,000, I think. 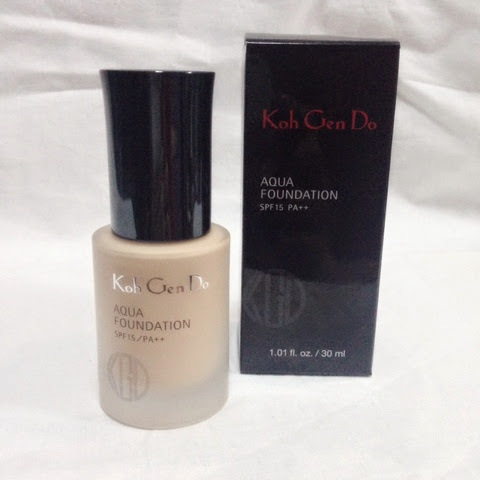 They put this on sale because Koh Gen Do has a new packaging for the liquid foundation. I find this foundation to be expensive. Some bloggers abroad consider this as a high-end brand. Quite honestly, I don't know and I didn't google enough to find out. Others are also comparing this with Chanel's Vitalumiere Aqua. I also have that so maybe I'll do a comparison post about those two. Koh Gen Do products are available at all Beauty Bar branches nationwide. Have you tried this foundation? Let me know how you like it! This gives such a lovely natural look - great review! Yey, please do a comparison post between those two foundations.